The other day I just had to get out of the house. Pierce needed some new socks, so the twins and I headed to TJ Maxx. Imagine my delight to discover they had all sorts of unusual muffin tins from Denmark! Yes, Denmark! They had trains and farms and butterflies. I would've bought them all if I could, but our budget is not that flexible. I picked up the mushroom cups and a bug tin. Here is what I made the first time using the mushroom cups. Pierce had a vegetarian "sushi" dish with raw tomatoes that I made from a recipe in Fitness magazine. It was really good, although I roasted our green tomatillos just a bit first (the red tomatoes I left raw - and the whole thing is in a soy based sauce - very flavorful). He also had fish sticks, peaches, and ketchup for dipping. 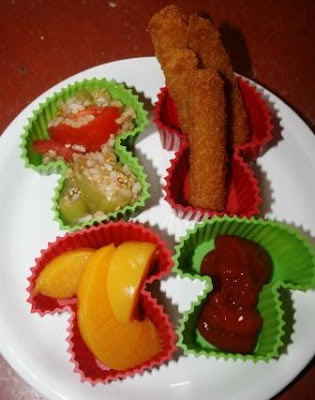 If you'd like more fun muffin tin meal ideas, check out Muffin Tin Mom. I love your muffin cups! What a find! JDaniel would love this meal. Now how cute are those! Buddha says, "I want to eat them, they're funny." So cute. I've said it before....but you really are an amazing mom!!!! Very cute finds! And I still love fish sticks. Every so often we have them for dinner. They were a big treat when I was a kid, so having them makes me feel like I'm about 5, and that's it's a special occasion. Isn't that silly! TJ Maxx is the best! That looks like a good lunch! What a surprise to find those! You get an A plus for use of your imagination in creating such fun meal presentations for the boys. No wonder they will eat such healthy foods! I love the mushroom cups!! If only my lunches were as interesting. oh those are so cute! what a fun find! How cute are these? I need to find me a TJ Maxx. Max. Whatever. I have missed these. Once again, I quit reading blogs. I am just having trouble getting back in the groove of life. I need to scroll back through as I know my favorite little guy started school and I am sure you posted pics of that! Oh these are so cute! I agree what a great find!! You make food so fun! And healthy! I always look at your muffin tin Mondays & think that I should totally do that! One of these days I really will LOL. what a GREAT find!!! and your lunch looks so tasty!!! Those are the cutest muffin cups ever...guess I better go check out TJMAXX! !